Recipe Ideas We know that recipes are at the core of your business. These recipes will give you virtually limitless ideas that will spark your culinary creativity.Our wide range of convenient, trusted products are sure to help you, whether you’re looking for something completely new or if you simply want to add an innovative twist to a classic favorite. 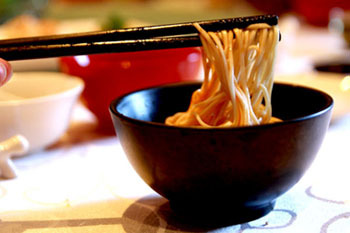 Vegetarian version of the popular Dan Dan Mian that uses Tofu to replace the ground Pork. Shiitake mushrooms provide added meatiness to the dish. To make dumplings, place a small spoonful of the filling in the center of the wrapper. Dab a little water with your finger and circle around the edge of the skin, and then fold and pleat the dumpling accordingly. Repeat the same for the rest.